Celebration!! The BERTH project model home has been built, together with beginnings of two waterless toilets and two bush showers. 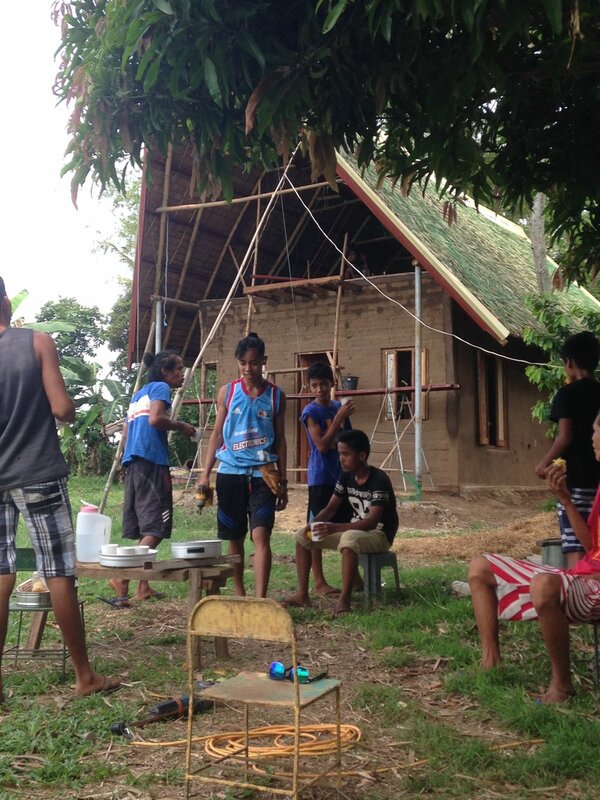 We encouraged a small group of volunteers to start a new venture, to learn new skills and knowledge while being involved in building an indigenous earth home. The toilet structure has an underfloor cavity essential for the functioning of two waterless toilets. The water from the corrugated iron roof will be the source for kitchen water and the bush showers. This development is a significant milestone toward making a sustainable eco home, with low maintenance and organic in its disposal of toilet and water wastes. These homes will provide an answer to the longstanding problem with hygiene and sanitation common to many rural areas in the Philippines. Our immediate challenge is to finish what we have started so that we will be able to welcome small groups for camping and weekend retreats. Food production will be our next focus, with an Aquaponic system first on the list. We are on the look out for someone with knowledge and experience to assist us in the creation of our initial model. We live in the midst of a culture of alcohol, domestic violence, gambling and drugs. Our purpose is not solely to assist people to have a house but to have a home that will grow and mature in love. We are increasingly convinced to live by the project’s core values: Commitment, Humility, Respect, Integrity, Servanthood and Truth. CHRIST who lived these core values in their truest sense is the cornerstone of this project. More important than physical outcomes, is the real change from within in peoples lives. Unless God’s goodness and purpose remain at the heart of what we do, we all would have laboured in vain. On Negros Island, at the end of a long winding path past busy huts, green rice fields and a few banana trees, you’ll find something very special: The Bamboo Earth Homes Project, short: BERTH. If you’re here to learn about a sustainable building method, you’ve surely come to the right place. But it won’t take you long to realise that physical homes are by far not the only thing that is being built here. Michael Dindo Pillora – or Sir Mike, as they call him – is a seasoned expert builder, both of homes and of community. As such, he knows of the importance of sound building material. Long before he figured out the details of the right soil mixtures, he invested much thought and prayer into crafting BERTH’s twelve core values. 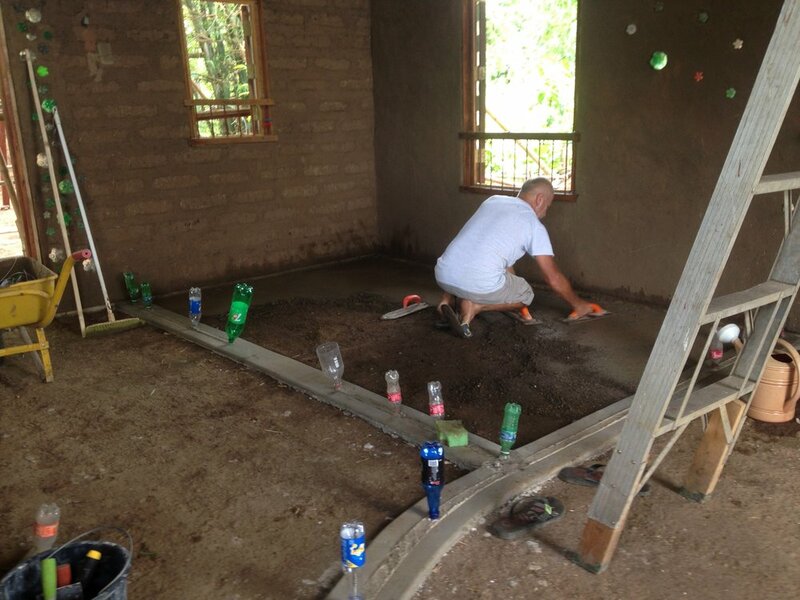 They are the most important building materials, and out of them the project’s real foundation is being made. Twelve words full of radical meaning in a world that claims greed and selfishness are your only means to get what you need. Twelve words whose initials spell it out twice: CHRIST. Because really, it is his love lived out when these twelve core values are practiced. She smiles brightly as she shows me her extensive vegetable garden on the project grounds. The young mother of seven and grandmother of one knows it takes more than time to grow nourishment. “Commitment brings goodness to people”, she says, plucking bean pods off their stalks. May May has diligently cared for this garden, and her commitment has been turned into baskets full of food to prepare for the project volunteers, including her children. Geneve’s cheerful resolve extends beyond promises. As some of the men are working on a piece of wall, she observes one of them cutting the thorns off a bamboo twig. Seeing a suitable tool, she pics it up and joins in, freeing twig after twig from its thorns and turning them into useful material to be worked into a mesh. It doesn’t take long for her friend to join in. Though it seems like a minor matter to take initiative in assisting others, Geneve’s continuity in doing so is an impactful example to other youngsters. “With her actions, she teaches others that we all benefit when everyone chips in. Because at BERTH, we make sure we celebrate our progress. The better progress we make, the better the celebrations”, says Michael as we are setting up for an evening of dinner and a movie projected onto a bedsheet. The kids scurry around in giddy anticipation. It seems like an impossible idea to be financing anything with the help of worms. But Michael knows that what happens below the surface can powerfully impact and shape the realities above. Just like the worms’ work below the surface enables strong growth above, so does trust among the project members enable visible growth in the BERTH project. It may be the last core value on the list, but it really is the starting point and the fertiliser that will help them grow together and flesh out the core values. 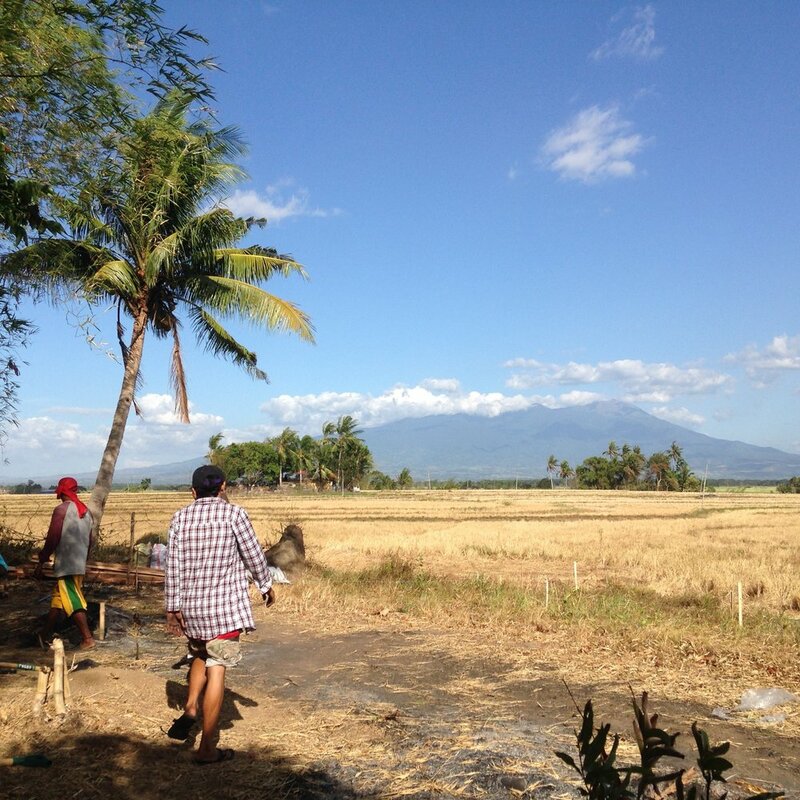 Flooded paddy fields, banana and palm trees, a water buffalo and green volcanic mountains in the background – I was soaking in a glorious sight as I was washing dishes on my first morning in the BERTH project. Most things here are unusual to a German who visits the Philippines for the first time. But as my week-long stay commenced, I was about to find out just how exceptional this project and the people involved in it are. Most physical aspects of the project are very recent additions: The house was erected and the Suzuki pickup was bought in the weeks before my arrival, the plumbing installed hours before I landed. But the BERTH project has really already come a long way since its birth years ago. Michael Dindo Pillora wove all his varied life experiences and professions into this project. From carpentry to youth work, project management and even music: BERTH is not just about houses, it’s about a community and its members thriving against all odds. Where poverty and a lack of prospect have led many to turn to addiction and callousness, Michael has been building friendships and solutions for years. And much has grown as a result, even quite literally: One morning MayMay, one of the project volun- teers, took me along to the vegetable garden behind the house and we harvested buckets full of long green beans, squash, bitter melon, eggplants and various leafy greens. She remembers well how not long ago, she used to worry about being able to buy food for her family. Now the project’s grounds provide healthy vegetables for the BERTH volunteer community. Michael has even more in sight. In front of the guest house, a large pond has been created. Soon he plans to farm fish in it which will supply them with a valuable and healthy form of protein. Fertilizer is required to create suitable conditions in the pond and Michael’s neighbour Jolie knows just the thing for that: worms. He has set up a worm farm to produce vermicasting, also known as “black gold”. Given a balanced diet of compost and manure, the special worms work tirelessly to produce the fine dark fertilizer that will boost not only the pond, but also the vegetable garden and, Michael hopes, the rice fields as well. “The young people here have no prospects. But with a small vermicasting production, they can earn their school fees by selling the fertiliser locally and actually get an education.” I realise he knows how to build so much more than houses. But of course houses, too, shall be built, and the first works are under way during my stay. Together with two teenage girls, Geneve and Griza, we cut the spikes off of bamboo twigs while the men build a frame with parallel spokes. Then, we weave the twigs through the spokes, creating a mesh. A vol- unteer named Junior creates a clay mixture and diligently covers the mesh, and in the end we all press our hands into the moist clay and leave our prints. 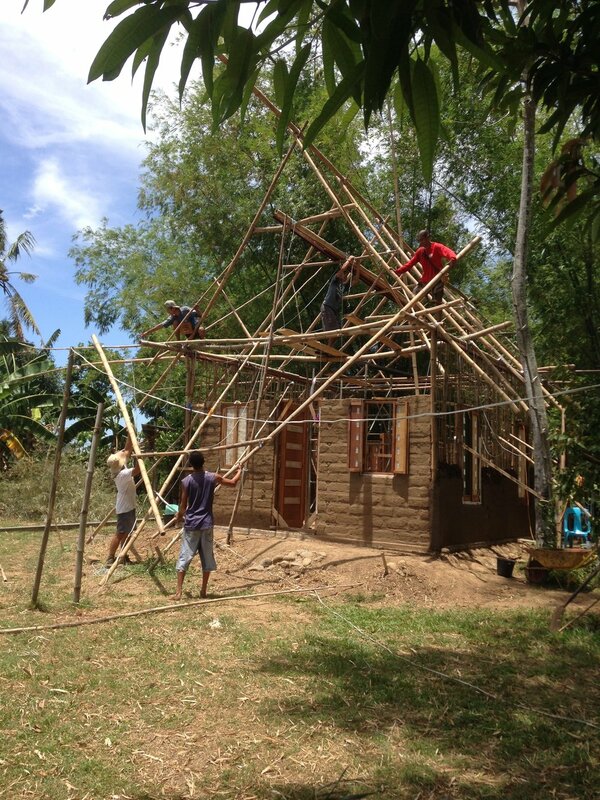 Michael’s goal is to erect the first bamboo earth home on the project’s grounds soon. 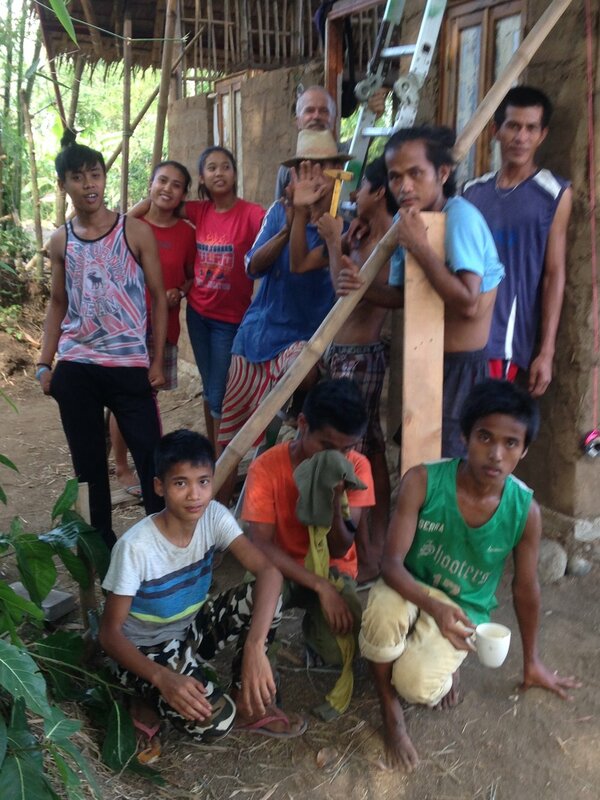 Then, he and the volunteers hope to become a training center for groups who want to learn how to build low-cost but high-quality homes in tropical areas. ith all the growing and building going on in the BERTH project, the most important surely are the core values. Michael has condensed them into twelve words: commitment and compassion, humility and honesty, respect and responsibility, integrity and initiative, simplicity and servanthood, trust and transparency – the first letters spelling CHRIST. As an experienced builder, Michael knows that a solid house needs a good foundation. And the core values are exactly that for BERTH. All the young people and volunteers know them by heart, and in conversation with them I learn how Michael’s practical teaching of them is beginning to change attitudes and lives. At night, as the light in the project’s open guest house shines brightly into its surroundings, I am thankful that BERTH shines by day as well, and I trust it will brighten its surroundings in most meaningful ways. Getting the projector to run and watching “Madagascar” with the young people one night. What a blast! Afterwards, they all camped in the make-shift tent we had set up behind the house. Looking down from the house, I saw the trees lit up by Michael’s solar-powered fairy lights and heard their happy chatter and giggles. The spontaneous conversation over lunch about the book of Esther with Jujie, a project vol- unteer, and MayMay and singing worships songs together. MayMay’s face beamed with joy when we realised we knew the same songs. Many thanks to Michael for responding to my email inquiry, inviting me to visit and providing so wonderfully for me all week. I am in awe of all that you are doing and thankful for your kindness, wisdom and integrity that you are blessing others with. Salamat also especially to MayMay and Jujie for sharing your hearts, thoughts and laughs with me, and to Jolie and all the young people for wel- coming me into your community, showing me the ropes and blessing me in countless ways. BERTH Project is a vision of a new affordable housing. Economical, environmentally friendly, sustainable, green and wholistic. It will be a created future of changed lives. Powered by a transformed sharing community based on core values of commitment, humility, respect, integrity, service and transformation. 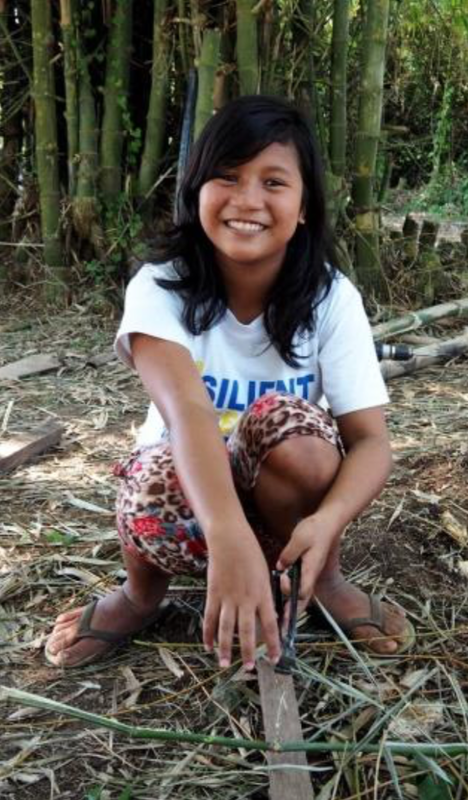 At present our partnership with an organic demo farm in Bacolod, Philippines has provided us with knowledge, skills and expertise in organic farming which will help us with our FAITH (Food Always In The Home) garden program. A vital part of our focus being on food and economic sufficiency. An aquaponic organic garden will be next. It combines fish culture and organic farming. Our source of inspiration is the successful 'Backyard Aquaponic' in Western Australia. Various seeds from Australian seed banks have already been purchased for planting in the Philippines for purposes of organic production and seed gathering. This month our organic farming specialist Davien Pati-on will be leaving for Uganda, Africa for a two month assignment to teach, train and establish mini organic projects with the farmers of Uganda. Davien has done a similar assignment in Laos and Cambodia in Asia. We have a team of three ladies involved in community outreach in an area of 50 kilometers in diameter with the municipality of Murcia. A local government that has recently been given a "Corruption Free Municipality Award" by the Commission on Audit. An auditing arm of the national government . These ladies are working in cooperation with the town government together with the Ecumenical Fellowship in the area. Their involvement covers values and character formation workshops as well as social and sports development programs. They also assist groups to network with other development programs and are active members of a vigilante chaplaincy group called NACPHIL (National Association of Chaplains in the Philippines) that monitors abuses and corruption in the government. Another beautiful, active partner Leah Aguirre who is the CEO of Katuwang Resource Center has given us very substantial support especially in organizing our BERTH Project board of directors and registering the project with the Securities and Exchange Commission as a non government and non profit project. Just about to be opened is our trust fund with Bank of the Philippine Islands which should enable us to have a PayPal account soon. 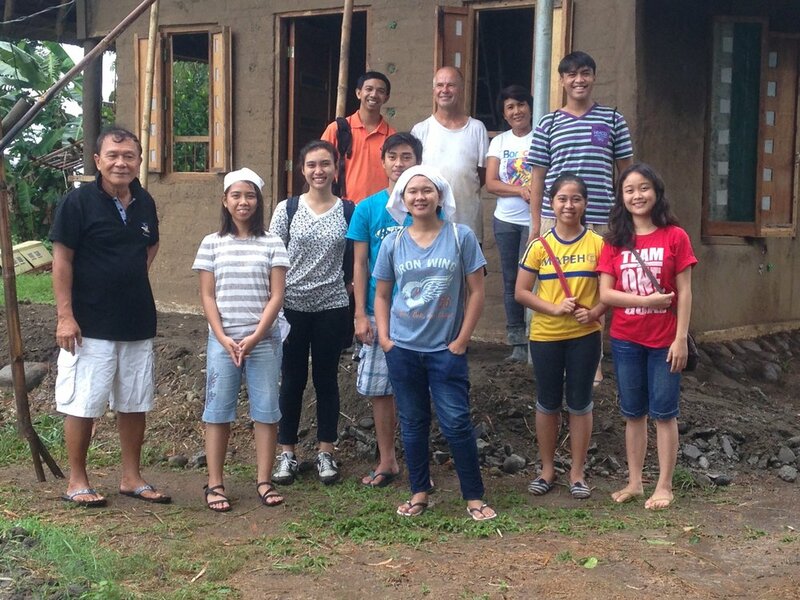 KATUWANG, a micro lending NGO is at present assisting more than 12 000 people to move out of poverty. I have visited some communities with her in April last year and been to her office several times which is enough to give myself a first hand experience of the extensive assistance that they are giving to many communities. “Mom Leah” as she is called is also one of the key persons involved in the establishment of LAB Organic Farm Project last April of 2012 of which Davien is the farm manager. Our partnership with “hands on” people involved directly with “grass roots” people is providing us with a solid gateway into various communities where we will be operating in the near future. In October last year Michael, through the assistance of Ray Trappel attended the EBAA (Earth Building Association of Australia) Conference which gave him the latest view on developments in Earth Building in Australia. BERTH Project has been received with positive interest and has already received actual support and contributions from some members. Michael is now an official member of EBAA. Together with Eric Thomson and Charlie Ocampo, appointments are being arranged to meet up with some aid organizations in Melbourne and Sydney. In Sydney, our BERTH Project working group has been organizing to send three Balikbayan boxes to BERTH Project Philippines. This shipment will consist mainly of early childhood learning materials gathered by Maritess in preparation for the community centers that we will be building as pilot projects in various communities. Our fund raising concert with Sining Lahi Cultural group in Sydney will help with the cost of the shipment. Special thanks to Menchie and Dr J. Languido and Leone Martinez of Austral Freight Couriers for giving us a special discount. In October Michael will leave for Chiang Mai, Thailand to learn about bamboo treatment. With BAMBOOROO, a bamboo project, whose project manager is Mark Emery an Australian architect who from the start encouraged us to push forward and make BERTH Project happen. After Thailand, Michael will fly to South Korea to attend a 'Peace for Life Conference ' in Jeju and connect with some Faith And Development networks during the '10th World Council of Churches Assembly' in Busan. In mid November, Michael will be in the Philippines to touch base with our BERTH Project working group before returning to Sydney via Thailand. In this update, we are sharing with you the truth that the realities that we have encountered have already changed our thinking and our lives. We take everything, positive and negative as precious opportunities for learning and encouragement. Our mission is clear: “to bring laughter, hope and love to others. To remind ourselves that our humanity is linked with theirs, to surrender to servanthood and to be thankful for everything always. With God's grace we can strive to live life giving lives so as to inspire others to do the same”. Instead of asking what our communities can do for us, we should be asking ourselves what we can do for our communities. "Berth" a place to rest or sleep. It also means to anchor, in order to find oneself in a safe and firm position. This acronym defines the very essence of this project. It is about building a home where commitment, humility , respect , integrity and service are the very values that will bring about the transformation needed so that one's restless being can find rest, joy and love. BERTH project also means being aware of our responsibility towards the many gifts of creation, including our environment and how fragile it has become. The urgent need for our care and respect demands that we become advocates for 'green initiatives' this is why our choice is bamboo and earth. We embrace the three R's: Reduce, Reuse and Recycle, therefore we will incorporate many simple uses for renewable energy. Organic Farming will be at the forefront of our concern. There is so much chemicals in our food chain and the poisonous flow needs to be broken because of the ill health and environmental destruction that it has brought about. We will advocate for FAITH gardens (Food Always In The Home) program. We have partners in the Philippines (LAB) that have already started an Organic Demo Farm and subsequent Organic Workshops. As well as introducing Solar Energy, there are also other new innovations like Composting Toilets and a food production technology called Aquaponics. The project will seek to involve as many volunteers as possible. People power will be the driving force behind the implementation of this project. The varied areas of services will give many people a real chance to contribute, serve and be a blessing to others. At this starting stage of the project it is important that while there is a solid reservoir of knowledge and skills ready to get BERTH project established it is good to realize that we are very much at the 'Stage of Possibilities". Everything needs to be seen under the umbrella of this reality. With our mission ,vision, goals and values having been clearly stated it is with joy that we share with you the news that the BERTH project is now firmly in it's establishment phase. BERTH project has just been recently approved by the Philippine government Security and Exchange Commission. Many thanks to our BERTH Philippine team led by Katuwang's Executive Director, Ms Leah Aguirre and the Board of Directors that made this approval possible and our sister projects like KATUWANG (info@katuwang.org) and LAB projects, which have been a source of great inspiration. In May 2009 Katuwang was servicing 10,500 clients which translates to 50,000 individuals being given opportunities to move out of poverty. These active and living links are paving a solid path for BERTH in becoming a real force for good in the near future. In Australia, the Sydney team has already collected Sports and Learning Materials for Early Childhood Education which will be our standby materials for community centers which will be BERTH's pilot project prior to home building. The ongoing establishment of BERTH has been blessed by the growing commitment of a number of people who have given their time and for some money as well as prayer support. These contributions have ensured a steady progress. We entrust everything in God's own timing and provision and remain thankful for so much that we have already received. In thanksgiving we remember everyone who have helped especially my son Jaime who has spent so much time with our brochures other materials and at present in the process of helping build our Website. A new fold up brochure will be out soon it will give us a pictorial view of many other possibilities and photos of people who so far has been behind the scene of BERTH project in the making. As a faith project we do not only ask what we can do for our communities but most importantly ask for wisdom to discern what God is doing in our communities so that we can be a part of his life giving action especially in peoples lives. We trust in the above promise and ENJOY EVERYTHING ! !